"Cover four seasons with this versatile, medium weight Merino jersey. The Indie Half Zip excels as a second layer and pairs thumbholes, a semi-fit cut, and the natural wicking and antimicrobial properties of wool for a next-to- skin option. Ample reason to recycle your pile of sweaty plastic fleece. Finely tuned 18.5 micron New Zealand Merino at 195g/m2. We designed this fabric from the need of a weight in-between our Woolies 1 at 150g/m2 and our Woolies 2 at 230g/m2. The weight of the fabric resembles that of a high quality t-shirt. 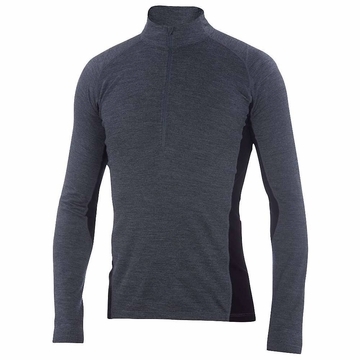 It works well worn next to skin as a baselayer or on it's own.